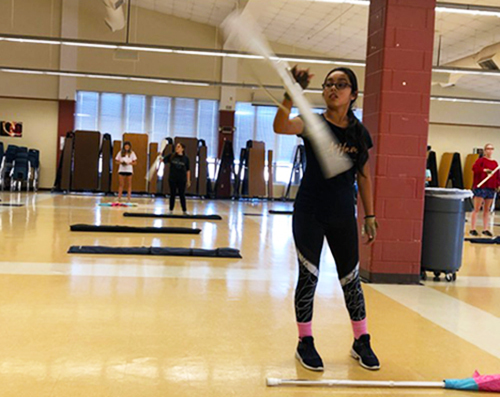 Freshman Ariel Melendez warms up on her rifle during her seventh period color guard class. “I think that it will be interesting to see a skill level difference between newbies and veterans, separating us and all," Melendez said. As marching season ends, the color guard has been working on their own show for the next incoming season, called winter guard. Winter guard is when the color guard performs by themselves without the marching band, using recorded music instead. However, the color guard is doing something different this year. Since there are over 30 members of guard this year, Instructor Samuel Woodfield has decided to make a junior varsity and varsity guard. According to Leyendecker, the guard are currently practicing their tryout routine, in which they have been working on for roughly two and a half weeks. There are currently 19 new members in the color guard. After try outs, members will be sorted into either the varsity guard or the junior varsity guard. 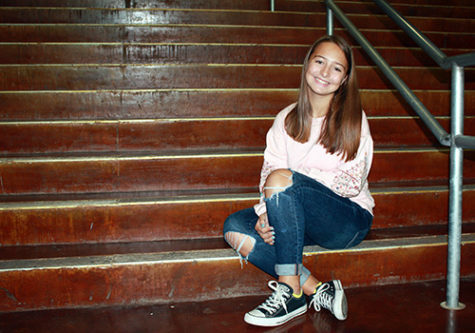 “I think that it will be interesting to see a skill level difference between newbies and veterans, separating us and all,” freshman Ariel Melendez said. Guard members look forward to what the new season brings. The color guard’s first performance and contest will be on January 26 at Medina Valley HS.